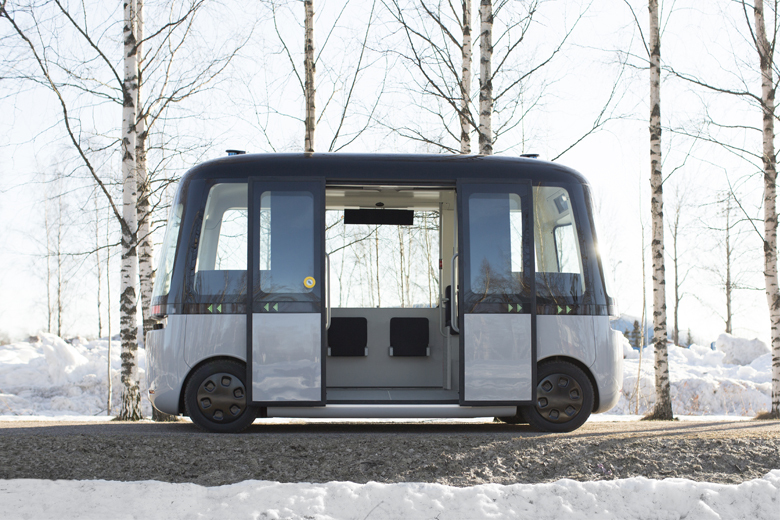 Gacha is the world’s first self-driving robot bus that works in any weather. What makes Gacha unique is its ability to work reliably even under difficult conditions – in the dark as well as rain, snow, or slush. The Nokian Hakkapeliitta winter tires rolling under the bus do their part to ensure that passengers are safe and comfortable even under extreme conditions. So far, difficult weather conditions have prevented self-driving cars from operating, since they have been developed and tested under warm conditions. Gacha uses completely new steering technology that has been tested to work under the arctic conditions in Lapland. This provides it with a unique competitive advantage over other self-driving solutions. The stylish Gacha is a revolutionary next-generation vehicle developed by Sensible 4 from Finland and MUJI from Japan. - We wanted to develop a self-driving bus that will operate reliably even in the worst weather. Difficult conditions also demand a lot from the interface between the vehicle and the road. This made Nokian Hakkapeliitta winter tires a natural choice for us and they complement our system in an excellent manner, says Harri Santamala, CEO for Sensible 4. Developed for extreme conditions, Nokian Hakkapeliittas were born from decades of experience in demanding and varying conditions. They are built for driving wherever sudden changes in weather are the norm. The safety of the winter tires is fine-tuned in the snow, ice, and slush at White Hell, the world's largest testing center for winter tires. Over 200 days of frost per year provide demanding, yet excellent conditions for testing and developing the world's safest winter tires. The tire is a vehicle's only point of contact with the road, which makes it an important safety factor – even for self-driving cars. According to a recent study conducted by Nokian Tyres in Europe, nearly 60% of drivers feel that winter tires are a car's most important safety accessory. What kind of tires will future vehicles need? - A lot will happen in the automotive industry in the near future. Traffic technology is networking and autonomous robotic vehicles will be an everyday thing. The control systems of these self-driving vehicles require state-of-the-art tires and versatile data on their operation in order to make driving proactive and safe under all conditions. Developing new types of services and smart tire technologies enables us to meet the changing needs of future traffic and clients, says Jukka Kasi, SVP, Products & Technologies for Nokian Tyres. The Gacha bus, fitted with non-studded Nokian Hakkapeliitta R3 winter tires, was introduced to the public in March 2019. The plan is to start using the bus in passenger traffic in three Finnish cities during this spring. Sensible 4 and MUJI aim to develop self-driving minibuses for public use and offer transportation services to consumers already in 2021. What could the future of mobility, driving, and winter tires look like in 2036?